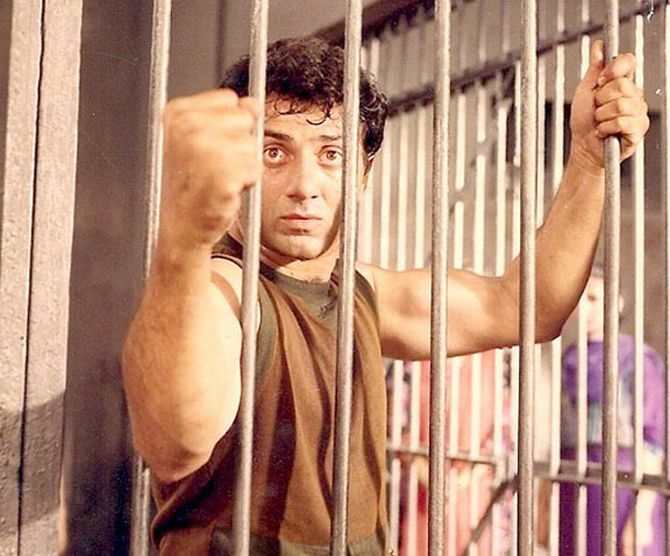 Rediff.com » Movies » Didn't watch Sunny Deol's 1990 Ghayal? Read this! Didn't watch Sunny Deol's 1990 Ghayal? Read this! 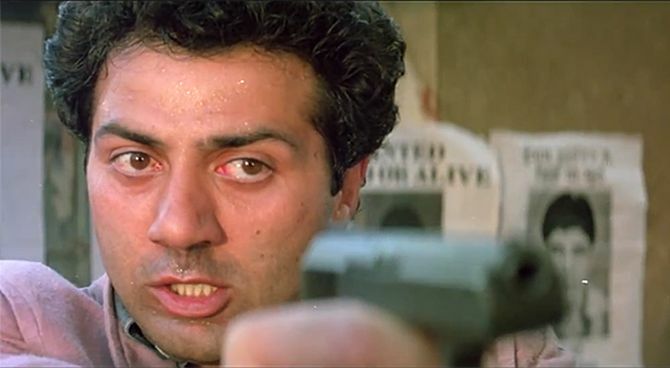 Looking back at Sunny Deol's dynamite delivery and dialoguebaazi in Ghayal. This is no empty threat. Not when coming from Sunny Deol anyway. And there's nothing Amrish Puri's brutish Balwant Rai, at whom it's directed, can do or say to save himself from Sunny's wrath. It's a foregone conclusion one eagerly anticipates in Rajkumar Santoshi's critically and commercially acclaimed directorial debut, Ghayal. Today, yes, we have seen the action hero explode on screen umpteen times to feel moved or surprised by Sunny's competency to single-handedly take down a wolf in sheep's clothing, admonish the corrupt law and order system or scream his lungs out at stunned spectators. 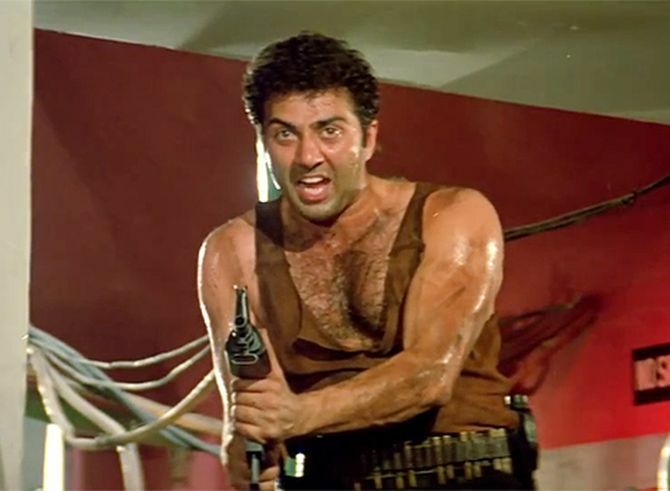 But when Ghayal released in 1990, Sunny's dynamite delivery made everyone sit up and take notice and spawned numerous recycles along the same theme. Although Arjun, Dacait and Yateem skilfully recognised his potential at playing wronged characters taking to the path of violence, their tone is decidedly mild compared to the livid, defiant demonstrations of his indignation in Ghayal. In another powerful display of aggression, he yanks out the witness stand from its foundation unable to hold back his disgust at Shafi Inamdar's last minute volte-face. Not all of Ghayal has aged all too memorably though. Of its 163-minutes running time, a lot feels like a stretch. Especially portions from the flashback where Sunny's Ajay Mehra narrates his nightmare and loss of innocence -- from an aspiring boxer to a man framed for murdering his own brother by the devious Balwant Rai -- to his three inmates (Sudesh Berry, Mitwa and Shabbir Khan) who later break jail and assist our hero in his revenge. The serious side of the script works fine but the comedy, tons of it and forcefully introduced, is plain dreadful. Ajay's bumbling coach Viju Khote, a random appearance of television serial Mahabharata's Bheema (Praveen Kumar) or the warped logic of Ajay convincing his brother and bhabhi (Raj Babbar and Moushumi Chatterji) how his girlfriend Varsha (Meenakshi Seshadri) is a better option than the nondescript Kantabai for household chores is all cringe inducing. Needless, ho-hum Bappi Lahiri songs that pop up every now and then make the ordeal even longer. The Lambada-rip off, Sochna Kya Jo Bhi Hoga screams for fast forward, as does the snooze-inducing Mahiya while Don't Say No, resembling Khuddar's Angrezi Mein Kehte Hain in its mood, is just about breezy. But the timing of these songs, Disco Shanti's Pyaasi Jawaani particularly, couldn't be more off. Instead of planning a strategy to beat Balwant Rai and his henchmen, Ajay and fellow fugitives take a break to lust over a buxom dancer in ways that can only make sense to a Bollywood distributor. What works is Balwant Rai, one hears his name repeatedly but doesn't actually see him till almost an hour into the film. Santoshi successfully builds him into the sort of ominous figure you don't want to upset and Amrish Puri plays him to the hilt. There's nothing costume-y about his cold, cocky, drug lord masquerading as society elite. Puri's penchant for intimidating glares and monstrous Muhahahas defines his villainy to a T.
With all the common man crusading against corruption and injustice, Ghayal doesn't have time to dwell in grey zones; evil and good are strictly in hues of black and white. Lack of timely response from the system meant to safeguard public will give rise to self-styled justice-seekers. It is both serious and dangerous. While Ghayal conveys it strongly, it also glorifies this approach unabashedly. So a 30-something Sunny, looking incredibly fit and fabulous, transforms from Rocky to Rambo to extract a Aakhri Raasta-reminiscent revenge on Sharat Saxena, Shafi Inamdar, Deep Dhillon, Brahmachari and, naturally, Amrish Puri. A first-rate Om Puri, as the well-meaning cop Joe D'Souza, hot on his trail and his regretful senior Kulbushan Kharbanda (held hostage) lend able support. The violence is, unsurprisingly, tame by today's standards. Even so, Ghayal's gung-ho background score and ideals, even at its most obvious are honest and unaffected. Every time they gaze into each other's bloodshot eyes, you feel sorry for Sunny and wish he could reunite with Meenakshi playing the strong, supportive anchor even though she's peripheral to the narrative. The actress has her moment when she laughs back at the bullying villain confident of a rescue even though she's only inches away from being tossed in a tank of boiling acid -- a welcome change from the 'Bachao' shrieking heroines. Villains, dens, old-fashioned devices of execution and punch lines reflecting the fervour of a bombastic era contribute to the thrills of Ghayal. His fiery dialoguebaazi paved the way to its repetition in future films rocketing his larger-than-life appeal. Though it found its place in glory, Ghayal didn't get off to a dream start. Director Santoshi, who had previously assisted Govind Nihalani, penned the story with Kamal Haasan or Sunny in mind but struggled to find a reliable producer. When he narrated the subject to Sunny, the actor was immediately struck by its potential. Eventually, his father Dharmendra produced Ghayal under his banner Vijayta Films. The film took about two and a half years to get ready and wasn't considered a safe bet among Deol well wishers. Despite all the cynicism, its A-certificate and clash with the Aamir Khan-Madhuri Dixit teenybopper romance, Dil, which also released on the same day, Ghayal hit box office gold. Interestingly, both Sunny and Madhuri went on to win Filmfare trophies for their performances in these respective movies. Of course, Ghayal went on to do even better and bagged two National Awards -- Special Jury Award for Sunny and Best Popular Film Providing Wholesome Entertainment. Funnily, Sunny wasn't confident about its favourable reception amongst critics. In an interview, the shy superstar recalled his reluctance to attend its pre-release press screening for fear of disapproval. Instead, when everyone stood up to applaud, he was both amazed and humbled. While it lasted, his partnership with Santoshi produced some of his best works -- be it the emotionally charged Ghatak or a crackling, career-best avatar in Damini. A 58-year-old Sunny Deol returns as Ajay Mehra in Ghayal Once Again, also directed by him, this Friday. Let's just hope he doesn't rub salt into it. PIX: Sunny Deol visits Rediff! Still love Sunny Deol? Tell us!